The solutions to the climate challenge require a substantive transformation of the current socio-economic development paradigm, including industrial change. This is not just about some technical changes to energy production or transport systems. What is required is a redefinition of the predominant model of production and consumption. We must give back to the state and public services their role in supporting our communities, and ensure that workers and trade unions are able to participate fully in all steps of this process. In an Op-ed published around the world, Geneviève Gencianos, PSI Migration Programme Coordinator, writes about public service workers who are at the frontline providing basic services to migrants, asylum seekers, and refugees. It is through public services that we can fight inequality and build resilient and inclusive societies. 17 December 2018 marks the approval by the UN General Assembly of the United Nations Global Compact on Refugees (GCR). A result of a series of thematic discussions and formal consultations conducted by the UNHCR from 2017 through 2018, the GCR aims to strengthen the international response to large movements of refugees and protracted refugee situations. On UN International Day for Disaster Prevention, PSI calls on UN to focus on public emergency workers and warns of increasing climate chaos. PSI welcomes the UN Intergovernmental Panel on Climate Change (IPCC) Special Report on global warming released on 8 October 2018. Earlier this year, the NGO Solar Head of State held a challenge targeting youth and young adults in which the goal was to inspire local or school communities to recognize the many advantages of solar energy. PSI affiliate the Jamaica Association of Local Government Officers (JALGO) was the only sponsor from the trade union movement and has contributed prize money to the challenge. Public Services International (PSI) is supporting the Food & Water Watch initiative to Ban fracking Now. Please join the social media storm on 10 December! Public Services International (PSI) and its European representative European Federation of Public Service Unions (EPSU) are very concerned that European delegations are not supporting the COP agreement to commit to Human Rights and a Just Transition. PSI requests all affiliates to urgently take action! Regardless of the outcomes of the United Nations Climate Change Conference negotiations in Paris, 30 November-10 December 2015, public sector workers need to be directly involved in finding and implementing the solutions to the climate crisis. As the UN Climate Change Summit, COP20, in Lima, Peru, draws to an end, PSI highlights the special role of local and national government structures in developing, implementing and monitoring green policies. Public Services International participated in the United Nations Open Working Group on Sustainable Development Goals, which had its eighth and final stock-taking and information-gathering session 3-7 February 2014 (OWG8), in New York. This report addresses the challenges of achieving environmental sustainability and turning the vision of decent work for all into a reality. Public Services International had the strongest global union presence at the World Social Forum 26-30 March 2013 in Tunis, Tunisia. PSI hosted and co-sponsored numerous events on trade union rights, youth, water, women’s issues, tax justice, energy and climate change. In the face of widening cuts to public services and attacks on the rights of public sector workers around the world, leaders of private and public sector trade unions, municipal governments and civil society groups made the unprecedented joint commitment to work together to promote investment in quality public services backed by fair taxation policies as the key solution to the economic crisis, and the best way to build peaceful, equitable, democratic and environmentally-sustainable societies. Environmental and social sustainability provided the primary theme for PSI’s work in 2009. Leading into the United Nations Climate Change Conference (COP 15) in Copenhagen in December, trade unions and civil society allies worked hard to ensure that world leaders would agree on an ambitious plan to reduce carbon emissions. Alas, this dream did not become reality. But we are committed to continuing this struggle and achieving real results. This meeting is part of the 5-year project (2018 – 2022) "Climate Change: Building Trade Union Capacities and Quality Public Services for a Just Transition" supported by Swedish Trade Unions - Akademikerförbundet SSR, Vision and Kommunal. Participating countries are Zambia, Tunisia, Kenya, Perú, Jamaica and Tonga. Under the theme, Transforming the Public Sector for Climate Governance, CAPAM will explore this topic and its many implications during the CAPAM 2018 Biennial Conference being held in Georgetown, Guyana from 22-24 October 2018. "Climate Change: Building Trade Union Capacities and Quality Public Services for a Just Transition" is a 5-year project (2018 – 2022) supported by Swedish Trade Unions - Akademikerförbundet SSR, Vision and Kommunal. Participating countries are Zambia, Tunisia, Kenya, Perú, Jamaica and Tonga. “Public Service Trade Union Responses to Climate Change” is a pilot project developed in cooperation with PSI’s Swedish affiliates. The project started in 2016 with affiliates in three African countries (Tunisia, Zambia and Kenya). In planning for further work in the 2018 to 2022 congress period, PSI expanded the pilot to include two countries in the Inter-Americas region, Jamaica and Perú. During the People’s Forum on BRICS on 13 October from 14-17h, TUED (which PSI is part of) and TNI are co-organising a workshop called “State of Power: Energy Democracy and Labour perspectives”. PSI’s affiliated union representatives will be intervening in the workshop that will be held in Goa, India. The World Social Forum is the largest global gathering of civil society to find solutions to the problems of our time by building concrete alternatives to the neoliberal economic model and to politics based on the exploitation of human beings and nature. At a time when racism is growing and negative narratives are growing against refugees and migrants fleeing poverty and oil wars, this 2-hours workshop at the Climate Generation Areas of Paris COP 21 organised by PSI affiliate the Public and Commercial Services Union (UK), combined a panel discussion and a debate with the audience. The biggest climate conference ever has opened in Paris under extremely tight security. The terror attacks of 13 November caused the French government to cancel the massive people’s demonstration on 29 November and have significantly altered the focus of the climate conference, as security issues permeate. Trade unions will be present in Paris and will be engaging between them and with allies on their experiences on climate change around the world. Join us in our forum! Local and regional government (LRG) workers are especially critical for both mitigation and adaptation to climate change, as more than half of humanity now lives in cities, and the rate of urbanization is accelerating. Changes are needed to make our cities equitable, safe and environmentally sustainable. PSI General Secretary, Rosa Pavanelli, with representatives of PSI affiliates will be taking part in a strategic discussion on advancing social ownership of energy organised by the Trade Unions for Energy Democracy (TUED) on 20 September 2014 in New York. 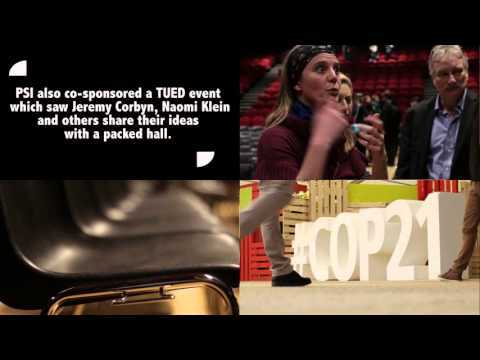 The TUED delegation will join in the People's Climate March on 21 September 2014. The 17th Conference of the Parties (COP17) to the United Nations Framework Convention on Climate Change (UNFCCC) and the 7th Session of the Conference of the Parties serving as the Meeting of the Parties (CMP7) to the Kyoto Protocol, will be held in Durban, South Africa. PSI Deputy General Secretary David Boys spoke at the World Conference on Disaster Risk Reduction, held in Sendai, Japan, on 16 March. With climate change looming, we are facing an energy emergency. How can unions fight for change? Watch and share TUED's new animated video on energy democracy. 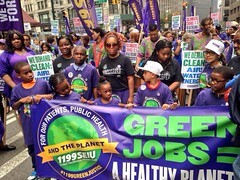 Following the strategic discussion on advancing social ownership of energy organised by the Trade Unions for Energy Democracy (TUED), PSI General Secretary, Rosa Pavanelli, and participants joined in the People's Climate March where over 400,000 people demonstrated in the streets of New York. Ahead of the People's Climate March on 21 September in New York City, PSI General Secretary, Rosa Pavanelli, and author and activist Naomi Klein, talk about Climate Change, Energy Democracy and the role of the trade unions. 2 min 8 sec ago.